Unlike most of his team-mates who rose from youngster level, Christopher Katongo was a late bloomer on his path to stardom in Zambia’s national team. Now, at the age of 30, his qualities as the Chipolopolos‘ top striker are honored with the BBC’s African Footballer of the year award. 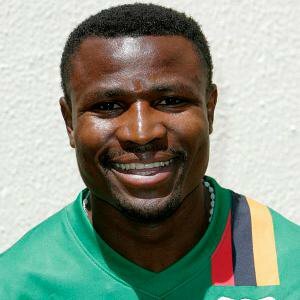 Born in Mufulira in 1982, Christopher Katongo first played with Butondo West Tigers and Kalulushi Modern Stars before moving to Green Buffaloes in 2001, where he kicked off his carreer and became well known all over Zambia between 2003 and 2004. His debut for Zambia’s Chipolopolo was soon to follow. After scoring a hat-trick against South Africa in 2007 (the 3-1 win away in Cape Town secured Zambia’s qualification to the 2008 African Cup of Nations) the Zambian army even promoted Katonga from sergeant to corporal. Short stopovers at South Africa’s Jomo Cosmos, Danish Brøndby IF, German Arminia Bielefeld and Greek Skoda Xanthi were up next between 2004 and 2010. As captain of Zambia’s Chipolopolo, Katongo lead his team to its unforseen victory at the 2012 African Cup of Nations. Since July 2011 Katongo plays for Chinese side Henan Construction.